MILLIGAN COLLEGE, TN (Oct. 14, 2013) — “Coming Home,” a photography exhibit featuring the work of Milligan College alumnus Michael Kaal, opens Saturday, Oct. 26, in the Milligan Art Gallery, located in the lower level of Derthick Hall. The exhibit will remain open through Dec. 6. A reception for the artist will be held during Milligan’s Homecoming festivities on Saturday, Oct. 26, at 11 a.m. The exhibit and reception are free and open to the public. Kaal, a native of Gilbert, Ariz., graduated from Milligan in 2010 with a Bachelor of Arts degree in fine arts photography. 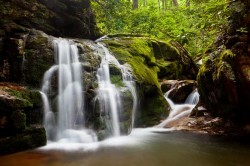 His exhibit will feature East Tennessee landscapes. For more information about art events at Milligan, visit www.milligan.edu/arts. To view Michael’s work, visit michaelkaalphotography.com. Posted by tommy on October 14, 2013.